The Wind River Reservation sweeps from the foothills of the Wind River Mountains across the plains of West Central Wyoming. It covers nearly three million acres, an area larger than Rhode Island and Delaware combined, and extends fifty-five miles from north to south and seventy miles from east to west. The reservation is beautiful in a stark and lonely way. 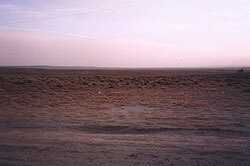 It is a land of vast open spaces and clear blue sky, with the Wind River Mountains rising on the western horizon. Summer weather is usually hot and dry, while winters can bring heavy snows and bitter cold. The wind blows nearly all of the time. Nevertheless, to the Arapahos, the reservation is the most beautiful place on the earth. It is "the Middle Earth." 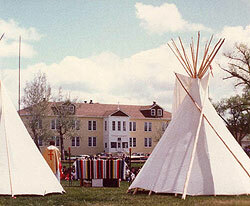 The Arapahos were placed on the Wind River Reservation in 1878, seven years after the Shoshones had been sent there. While the Shoshones had settled along the foothills, the Arapahos moved into the valley, close to the Little Wind River. Even though the two tribes had been traditional enemies, they have shared the reservation peacefully for more than a century. A Joint Council, made up of the Shoshone and Arapaho tribal (business) councils, manages the reservation. Part of the economy is based upon oil and gas. A percentage of the royalties from this natural resource supports the tribal governments. The rest is paid to individual tribal members. In addition, many Arapahos are ranchers who raise Hereford cattle. 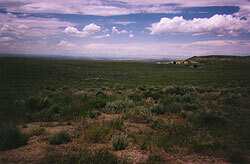 The tribe also operates the large Arapaho Ranch. St. Stephen's Mission, the inspiration for Margaret's St. Francis Mission, has been a religious and social center for the Arapahos since 1884. Here is a photo of a Powwow held on the grounds of the mission (in front of Father John's office!). The photo is by Father Tony Short, S.J., pastor at St. Stephen's for eleven years.